Where do I use my Proporta voucher code? Choose a code from the Proporta deals page and copy it. Follow our link to the Proporta website. Browse for your items and add them to your basket. When you’re finished press checkout. In your basket page, you’ll see an ‘Add Promotion Code’ box. Paste your code into here and click ‘Apply Discount’. Your savings will be automatically applied to your order and you can then ‘Go To Checkout’. Here at NetVoucherCodes, we have hundreds of voucher codes to help you save money on your online shopping. When shopping for phone and gadget cases and accessories at Proporta why not check out our discount codes and grab a bargain online! Simply browse our Proporta deals page and choose from all the biggest discounts and latest promotions available including sales, offers and deals. With the help of us, you thrifty shoppers out there could find yourself saving a fortune, no matter what your age or preference. Discover the superb collection of Ted Baker cases and accessories for your all your smartphones and gadgets at Proporta. As the exclusive partner of the fashion label Ted Baker, you can shop the largest collection of the brand's official tech accessories right here. You can find everything from luxury iPhone X/8/7/6s/6 cases to Samsung Galaxy S7/S8/S8+ back shells, no matter what you need, there's something for everyone. Don't forget to explore the Ted Baker new AW17 collection, ‘Keeping up with the Bakers’ and discover all the latest and most stylish Ted Baker mobile accessories and cases. The choice of iPhone cases, bumpers and covers and accessories at Proporta will protect and complement your new iPhone perfectly. Proporta has a wide range of iPhone 6 covers in stock including Proporta and Jack Wills iPhone cases, so you can keep your iPhone protected and looking stylish all at the same time! You can find in car accessories for your iPhone 6, stands, screen protectors, power products, cables and adaptors and, of course, cases. 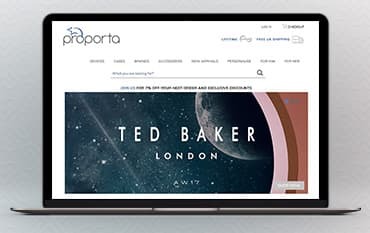 Proporta offers a variety of mobile devices, cases and accessories as well as similar items for tablets and iPads with their own brand of high-quality products and the help of some other big name brands such as Ted Baker. Established in 1996, Proporta has witnessed the rise of trans-formative electronic devices and have led the way in constantly evolving to create high quality, trendy accessories and extras to compliment each new product that hits the mobile scene. With awards for their iconic Turbo Charger and recognition for their brilliant design and quality, Proporta is the very best when it comes to anything mobile. Check them out now and use our Proporta voucher codes to save you money on their site.